Spring is officially here and the weather is finally starting to show it! The last few weeks we have had some teases of warm weather and this immediately gave me the outdoor itch! Being outside is all anyone wants to do and the best place to be outdoors is at home. This porch has a comfortable feel for dining or just hanging out, the beautiful light fixture could also set the mood for evening entertaining! I love this casual feel, this huge outdoor sectional is the perfect spot for family and friends to gather. The colorful pillows are sure to put you in a great mood, I hope there is a pool nearby! This patio has an intimate feel, the walls are covered in greenery and although the space has a lot of hard surfaces it does not feel stark. With a fireplace, grill and seating I would never leave this oasis! What a view! Here we have a simple table and chairs surrounded by nature, just add the food and friends and you have the perfect night! Dining in a garden sounds great to me! The pom poms hanging are a fun touch and you can escape to paradise! A bed outside? This should be in every backyard, the perfect place for a relaxing afternoon! 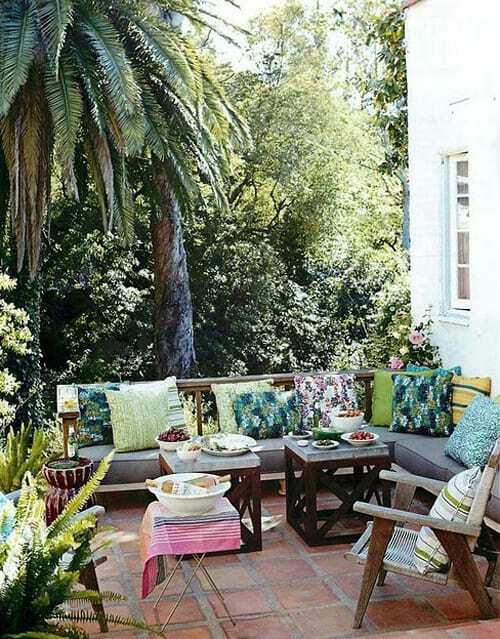 As far as outdoor entertaining goes, this is ideal! I love the structure and scale of the greenery and pool. A small pool can cool you off as well as a large one and is less to keep up with! So now that the weather is lovely and you are done with reading this blog, get outside and enjoy the sunshine! If you have nowhere to sit, come by Nandina Home & Design in Aiken or Atlanta and we can certainly help you find some outdoor furniture to fit your needs!